Volcanic gases entering the atmosphere with dust and tephra during eruption of Augustine Volcano, 2006. Volcanic gases are gases given off by active (or, at times, by dormant) volcanoes. These include gases trapped in cavities (vesicles) in volcanic rocks, dissolved or dissociated gases in magma and lava, or gases emanating directly from lava or indirectly through ground water heated by volcanic action. groundwater and the Earth's atmosphere. Substances that may become gaseous or give off gases when heated are termed volatile substances. 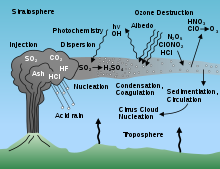 The principal components of volcanic gases are water vapor (H2O), carbon dioxide (CO2), sulfur either as sulfur dioxide (SO2) (high-temperature volcanic gases) or hydrogen sulfide (H2S) (low-temperature volcanic gases), nitrogen, argon, helium, neon, methane, carbon monoxide and hydrogen. Other compounds detected in volcanic gases are oxygen (meteoric), hydrogen chloride, hydrogen fluoride, hydrogen bromide, nitrogen oxide (NOx), sulfur hexafluoride, carbonyl sulfide, and organic compounds. Exotic trace compounds include mercury, halocarbons (including CFCs), and halogen oxide radicals. The abundance of gases varies considerably from volcano to volcano, with volcanic activity and with tectonic setting. Water vapour is consistently the most abundant volcanic gas, normally comprising more than 60% of total emissions. Carbon dioxide typically accounts for 10 to 40% of emissions. Volcanoes located at convergent plate boundaries emit more water vapor and chlorine than volcanoes at hot spots or divergent plate boundaries. This is caused by the addition of seawater into magmas formed at subduction zones. Convergent plate boundary volcanoes also have higher H2O/H2, H2O/CO2, CO2/He and N2/He ratios than hot spot or divergent plate boundary volcanoes. Magma contains dissolved volatile components, as described above. The solubilities of the different volatile constituents are dependent on pressure, temperature and the composition of the magma. As magma ascends towards the surface, the ambient pressure decreases, which decreases the solubility of the dissolved volatiles. Once the solubility decreases below the volatile concentration, the volatiles will tend to come out of solution within the magma (exsolve) and form a separate gas phase (the magma is super-saturated in volatiles). The gas will initially be distributed throughout the magma as small bubbles, that cannot rise quickly through the magma. As the magma ascends the bubbles grow through a combination of expansion through decompression and growth as the solubility of volatiles in the magma decreases further causing more gas to exsolve. Depending on the viscosity of the magma, the bubbles may start to rise through the magma and coalesce, or they remain relatively fixed in place until they begin to connect and form a continuously connected network. In the former case, the bubbles may rise through the magma and accumulate at a vertical surface, e.g. the 'roof' of a magma chamber. In volcanoes with an open path to the surface, e.g. Stromboli in Italy, the bubbles may reach the surface and as they pop small explosions occur. In the latter case, the gas can flow rapidly through the continuous permeable network towards the surface. This mechanism has been used to explain activity at Santiaguito, Santa Maria volcano, Guatemala and Soufrière Hills Volcano, Montserrat. If the gas cannot escape fast enough from the magma, it will fragment the magma into small particles of ash. The fluidised ash has a much lower resistance to motion than the viscous magma, so accelerates, causing further expansion of the gases and acceleration of the mixture. This sequence of events drives explosive volcanism. Whether gas can escape gently (passive eruptions) or not (explosive eruptions) is determined by the total volatile contents of the initial magma and the viscosity of the magma, which is controlled by its composition. The term `closed system' degassing refers to the case where gas and its parent magma ascend together and in equilibrium with each other. The composition of the emitted gas is in equilibrium with the composition of the magma at the pressure, temperature where the gas leaves the system. In `open system' degassing, the gas leaves its parent magma and rises up through the overlying magma without remaining in equilibrium with that magma. The gas released at the surface has a composition that is a mass-flow average of the magma exsolved at various depths and is not representative of the magma conditions at any one depth. Molten rock (either magma or lava) near the atmosphere releases high-temperature volcanic gas (>400 °C). In explosive volcanic eruptions, the sudden release of gases from magma may cause rapid movements of the molten rock. When the magma encounters water, seawater, lake water or groundwater, it can be rapidly fragmented. The rapid expansion of gases is the driving mechanism of most explosive volcanic eruptions. However, a significant portion of volcanic gas release occurs during quasi-continuous quiescent phases of active volcanism. As magmatic gas travelling upward encounters meteoric water in an aquifer, steam is produced. Latent magmatic heat can also cause meteoric waters to ascend as a vapour phase. Extended fluid-rock interaction of this hot mixture can leach constituents out of the cooling magmatic rock and also the country rock, causing volume changes and phase transitions, reactions and thus an increase in ionic strength of the upward percolating fluid. This process also decreases the fluid's pH. Cooling can cause phase separation and mineral deposition, accompanied by a shift toward more reducing conditions. At the surface expression of such hydrothermal systems, low-temperature volcanic gases (<400 °C) are either emanating as steam-gas mixtures or in dissolved form in hot springs. At the ocean floor, such hot supersaturated hydrothermal fluids form gigantic chimney structures called black smokers, at the point of emission into the cold seawater. The gas release can occur by advection through fractures, or via diffuse degassing through large areas of permeable ground as diffuse degassing structures (DDS). At sites of advective gas loss, precipitation of sulfur and rare minerals forms sulfur deposits and small sulfur chimneys, called fumaroles. Very low-temperature (below 100 °C) fumarolic structures are also known as solfataras. Sites of cold degassing of predominantly carbon dioxide are called mofettes. Hot springs on volcanoes often show a measurable amount of magmatic gas in dissolved form. outside the gas by ground-based or airborne remote spectroscopy e.g., Correlation spectroscopy (COSPEC), Differential Optical Absorption Spectroscopy (DOAS), or Fourier Transform Infrared Spectroscopy (FTIR). Sulphur dioxide (SO2) absorbs strongly in the ultraviolet wavelengths and has low background concentrations in the atmosphere. These characteristics make sulphur dioxide a good target for volcanic gas monitoring. It can be detected by satellite-based instruments, which allow for global monitoring, and by ground-based instruments such as DOAS. DOAS arrays are placed near some well-monitored volcanoes and used to estimate the flux of SO2 emitted. The Multi-Component Gas Analyzer System (Multi-GAS) is also used to remotely measure CO2 and SO2. The fluxes of other gases are usually estimated by measuring the ratios of different gases within the volcanic plume, e.g. by FTIR, electrochemical sensors at the volcano crater rim, or direct sampling, and multiplying the ratio of the gas of interest to SO2 by the SO2 flux. Direct sampling of volcanic gas sampling is often done by a method involving an evacuated flask with caustic solution, first used by Robert W. Bunsen (1811-1899) and later refined by the German chemist Werner F. Giggenbach (1937-1997), dubbed Giggenbach-bottle. Other methods include collection in evacuated empty containers, in flow-through glass tubes, in gas wash bottles (cryogenic scrubbers), on impregnated filter packs and on solid adsorbent tubes. Analytical techniques for gas samples comprise gas chromatography with thermal conductivity detection (TCD), flame ionization detection (FID) and mass spectrometry (GC-MS) for gases, and various wet chemical techniques for dissolved species (e.g., acidimetric titration for dissolved CO2, and ion chromatography for sulfate, chloride, fluoride). The trace metal, trace organic and isotopic composition is usually determined by different mass spectrometric methods. Certain constituents of volcanic gases may show very early signs of changing conditions at depth, making them a powerful tool to predict imminent unrest. Used in conjunction with monitoring data on seismicity and deformation, correlative monitoring gains great efficiency. Volcanic gas monitoring is a standard tool of any volcano observatory. Unfortunately, the most precise compositional data still require dangerous field sampling campaigns. However, remote sensing techniques have advanced tremendously through the 1990s. The Deep Earth Carbon Degassing Project is employing Multi-GAS remote sensing to monitor 9 volcanoes on a continuous basis. Volcanic gases were directly responsible for approximately 3% of all volcano-related deaths of humans between 1900 and 1986. Some volcanic gases kill by acidic corrosion; others kill by asphyxiation. The greenhouse gas, carbon dioxide, which is odorless, is emitted from volcanoes, accounting for nearly 1% of the annual global total. Some volcanic gases including sulfur dioxide, hydrogen chloride, hydrogen sulfide and hydrogen fluoride react with other atmospheric particles to form aerosols. ^ Burton et al. (2007) Magmatic Gas Composition Reveals the Source Depth of Slug-Driven Strombolian Explosive Activity Science vol 317 p.227-230.